My family loves eating seafood so I have to search variety of seafood menu to cater the family desire. One of our favorite seafood dish is this Chilli Curry Crab. What makes this dish so special is its sensuous, sweet yet savory sauce, created with a base of chilli and tomato sauces which will satisfy your taste buds. This famous dish is traditionally served with a plate of hot rice. 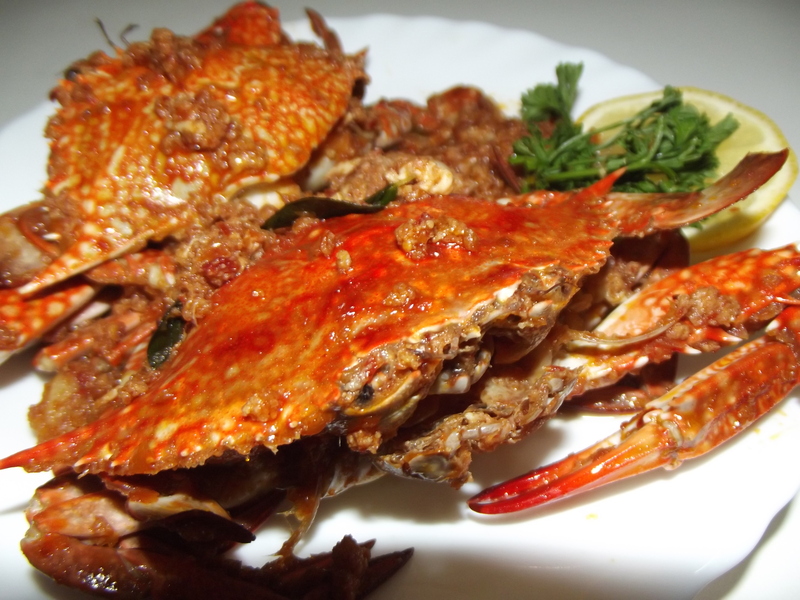 Here is a quick and easy chilli curry crab recipe. This recipe involves crab pieces cooked in a chili sauce, tomato sauce, corn starch, ginger, garlic, egg, curry leaves and lime juice. You can garnish crab with fresh herbs. 1. Wash and clean the crabs. Remove the gills and spongy parts under the shell. Cut the body into 4 pieces. 2. Heat 2 tablespoons of oil, and saute the onions. Fry the onions until light brown and add ginger, garlic and red chillies. Cook on a medium flame for about 3 to 4 minutes. 3. Add the crabs and stir well until there is change in color on the crab shells. 4. Then add chilli sauce, ketchup, water and mix well and cook for 3 to 4 minutes on a medium flame. 5. Finally add egg and corn starch and stir well for 3 minutes. 6. Cover and cook the crab for another 4 minutes. 7. Garnish with herb leaves. Thanks for following my blog. I hope you enjoy looking through all the recipes and pictures. I have quite a collection of healthy and non-healthy items. Please let me know if you try anything! Your recipe sounds fantastic! I like that you’ve got a bit of lime, curry leaves, ketchup – lots of flavours. I’ve only had chilli crab in seafood restaurants (mostly in Hong Kong and Singapore), but this post makes me think that perhaps crab is also do-able at home. I agree with you that this dish is always available in the seafood restaurants but we always make this at home since it is convenient and fast. It’s good to know that you’ve found it a quick dish to prepare and cook. Must be a lot cheaper than eating out in the restaurants, too! I’ve already bookmarked your recipe.